Click here to access and print your Rx, invoice, and next appointment. Call us at (316) 260-6280 today. Good vision is too important to take for granted. At our optometry office, the health of your eyes and helping you see better are our main concerns. As professionals in the field of optometry, we are able to provide you with comprehensive eye examinations to not only correct refractive errors, but also detect underlying vision problems. Through comprehensive examinations, our optometrist can discover a developing eye condition and being treatment right away - often before it severely affects your vision. Refer 2 patients and receive a free pair of sunglasses. Contact us for more details. Dr. Boyle has been providing high quality eye care in private practice since 1996, and has owned his own practice since 2010. He graduated from Friends University with a bachelor of science in biology, and graduated with his optometry degree from University of Houston College of Optometry. He has served as president of the Wichita Optometric Society. Dr. Boyle has also served on the board for the Kansas Optometric Association, the See to Learn Foundation, and Kansas Optometric Foundation. Dr. Boyle believes that excellence in optometry begins with a careful diagnosis and treatment. Dr. Boyle administers advanced testing to people of all ages; and with our cutting age technology he has the ability to diagnose and treat a variety of eye diseases and disorders. Communication and long-term relationships are very important to all of us here, so we encourage questions at any point in your visit. We want everyone to be informed about their ocular health every step of the way. "Dr. Boyle took the time with me. He didnt rush me or make me feel like a number. He was patient and answered all of my questions. The entire staff is very friendly and after having seen 2 other eye drs in Wichita (new to town), I have found a good one. Thanks, Dr. Boyle and staff. I will be back." "Dr Boyle and his entire staff are friendly and professional. I'm a school nurse and he has taken extra time to explain things to me that I encounter in my work, which helps me provide better care to kids and give better advice to parents. My own kids have their eye exams and get glasses here; they feel comfortable with and like everyone on staff." "Bruce and his entire operation are "Top Shelf". Bruce found a problem with our sons vision that had been over looked, which was a cause for slowing his reading ability. the staff are great, always accommodating and informative. Ed Ramsey is the Optician at Bruce's clinic. He is beyond good. He will not rush any patient and guides you through the selections for your glasses or contacts. my glasses are a pleasure to wear rather than a pain thanks to Ed." "They are great! Friendly, helpful, and always a pleasure to visit their office. Broke my glasses last night and this morning Ed had me fixed up and ready to go in no time. Thank you!" "Excellent Eye doctor! My appointment was fast and I felt I was well informed about my eye health. 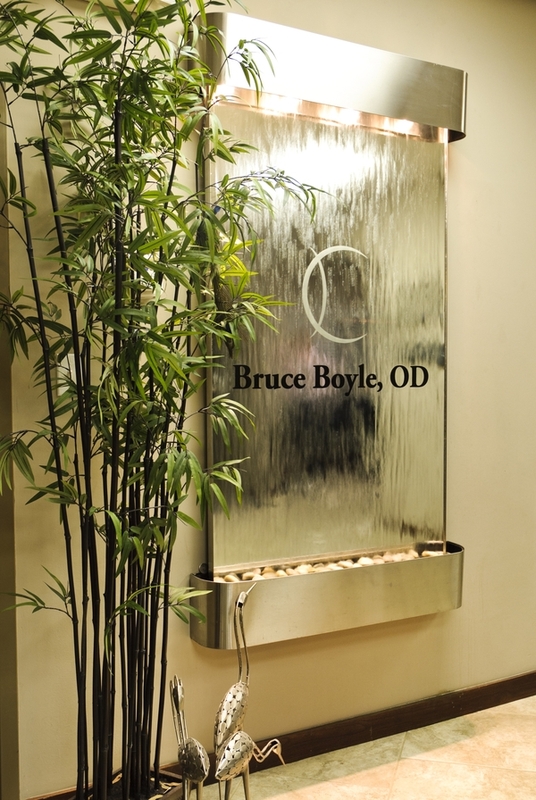 I would definitely recommend Bruce Boyle, OD. The ladies upfront are upbeat and knowledgeable and the optician is fantastic." "I like Dr Boyle and all his staff the are very friendly and professional I will always go to them for all my family and my eye health needs ."